Baby boomers are retiring or preparing for retirement every day and downsizing is often part of the strategy. In a recent issue of SmartMoney magazine, there was an article about the trials of unloading our stuff. Not only do we have to get rid of our stuff, but sometimes the lifetime accumulation of our parents. The process is difficult emotionally and financially for some. The purging of the excess junk is flooding the market with valuables. According to the article, dealers say the value of high end items has plunged 50% or more. We were spend generation and now we don’t want it anymore and neither do our kids. Then there is the perceived value for an item versus reality. Part of it this disconnect can be attributed to forgetting about depreciation and the other to emotional attachment. One specialist advises clients to take a zero off the price of what they paid originally to reset expectations. The usual suspects for selling off unwanted items are too time-consuming when it comes to an entire houseful of items. One alternative people are turning to are estate liquidators. They have the tools and expertise to handle the whole job from inventory to donating unsold stuff. Usually, they have a mailing list of regular customers and the staff to handle a large sale. Using an auction house is another option. Prices are set by the highest bid in the group so if turnout is bad, high value items can be bought dirt-cheap (reserves can be set in advance). I’ve found liquidator sales to be common where I live now but auctions are most often used for estate sales in Kansas where my parents live. The downside to both methods is that you will pay a sizable commission for all this assistance which greatly reduces the final payout. Whatever method you decide to use to downsize, I recommend purging your possessions thoroughly and often. Mr. Boomer and I did our first big purge of stuff seven years ago when we moved from a home he’d lived in 30 years. Remember, whatever you don’t get rid of your heirs will have to deal with. What are your downsizing plans? My downsize was from an Apple powerbook to just the basic ibook. I’ve had my heart set on the powerbook, but i really don’t need it for what I do for a living. I have a good friend who used an auction house to hold his estate sale, liquidating a large part of his stock (he’s a yard sale “picker” on the side), as well as many items from his MIL’s estate. The commission was 15% on anything over $10. His regular auction house, the one he mainly deals with week in week out, wanted to charge the standard 20%. Obviously, they didn’t get the gig, and got their feelings hurt a little. But, business is business. Nice article, by the way. Spotting and understanding the trends driven by the boomer generation is a prudent thing. This is great news for people like my husband and I who are more minimalist by nature, and never want to pay full price! We’ve been going to Craigslist and yard sales for many of our needs and living off of other people’s indulgences. Thanks so much for stopping by my blog! Downsizing can be such a blessing on both sides of it. Those who are downsizing get to get rid of their stuff and people who will really enjoy it will find it at a significant discount. It just plain makes sense to use professionals to run everything for you. 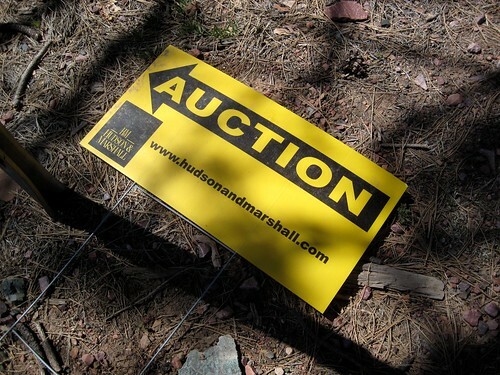 I would imagine that just in knowing how to properly price and market to buyers a good estate sale team could generate more than enough revenue to cover their commissions. I would love to get rid of at least a third of the stuff in my house. But, Mrs. Prosper would definitely have a problem with that. My brother owns a landscaping compeny. About five years ago, I borrowed his dump truck and threw out three tons of stuff. The house looked so much nicer and I just felt free and unencumbered by clutter. I’d like to do it again. Interesting take. Didn’t realize the market is being flooded with valuables. Funny, my parents are cleaning house, too. Never put two and two together that it would fall in our hands. Another option worth considering is the estate sale. Around here there are a bunch of small enterprises who will go into a home and organize everything the seller wants to unload; set a value on each piece; organize, advertise, and run the sale; and then have Goodwill come get whatever doesn’t sell. They’ll do it for people who want to downsize as well as families of th’deceased. This part of the country is pretty transient, and so the constant movement supports a number of these little companies. But I believe there are similar outfits all over the country. Thanks for the tips. Your articles are always useful, my parents are boomers so im always paying attention to things that will help them out. My mom has a ton of clutter in the attic and needs to get rid of a lot of it. @Max, I would never think about downsizing electronics! @ Amanda, that’s another reason for sharing this trend. If we have to get rid of our stuff at crazy prices, might as well have it go to my bargain-seeking friends. @ Half-Assed Economist, my husband and I will need to clear our the homes of our remaining parents most likely within the next 5-10 years. We’ll definitely use professionals. @ Bret, I got a great visual from your comment. I loved it when we did the big purge about 7 years ago before moving. My husband had decades of junk in his “work” room. @ Buck, you can get good bargains on the used stuff nowadays. Just shop the used marketplaces: Craigslist and garage, rummage and estate sales. @ Funny, it seems like a lot of work for the cut they get but I guess there’s a niche for everybody.